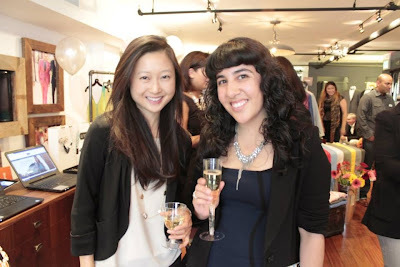 On Thursday I attended a happy hour event in SF hosted by LE TOTE and Bonobos. I sipped champagne and mingled, while browsing the clothes and jewelry available in LE TOTE's summer collection. LE TOTE runs for $49 a month, which is not too bad of a deal after seeing all the gorgeous clothes and accessories. We had a discount available at the party for 20% off, so I ended up paying only $42. I am very excited for my first tote to arrive! And last but not least, there needs to be a shout out for the lovely flowers supplied by BloomThat at the event. Aren't the blooms lovely? Their flower delivery service is a great alternative than other delivery services in SF because they source local florists/flowers and deliver in the city in under 90 minutes. This is the second event I've seen their work at, and I definitely recommend them! This concludes my Thursday night in SF! Hope you liked the photos and let me know if you've tried any other clothing rental services before. I am excited to be trying out LE TOTE after seeing and feeling their items and sharing them on my blog! Be prepared for an overload of outfit posts and a cupcake post later this week.